Are you a High School or College player that will graduate this year with a passion for playing baseball and your not ready to take off the cleats and hang up your glove? Well get a Wood Bat, put the cleats back on and continue to play baseball next Summer 2014 in the Northwest Independent Baseball League. Play on one of the 16 teams next summer. You can continue playing competitive wood bat baseball, make new friends, network with league players, coaches, and managers. Register Here for Summer 2014 and get back in the ball game. 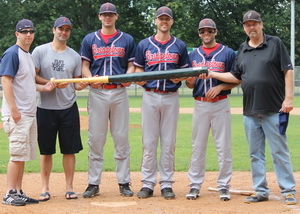 Big Bat Trophy for the 2013 Season.